Twenty-three-year-old Liza swore she’d never go home, but after her divorce, she returns to live with her mother. As Liza attempts to start life over, she’s forced to deal with her eccentric mother, Minnie, who lives in the back of her antique store. When a toddler is abandoned in her mother’s store, Liza’s life dramatically changes. She takes care of the child in hopes the girl who left her will return. As time passes, the toddler steals Liza’s heart. 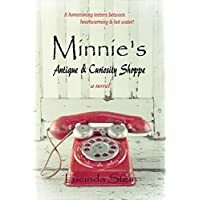 The idea for Minnie’s Antique & Curiosity Shoppe came from an antique store in my hometown that moved into the old JCPenney building where my mother had worked for years. Add the fact I knew of a woman in a small town who did live in her antique store, and the story started percolating in my mind. The book is all about relationships—-the tension that knits between mothers and daughters, old and new romances, and the special relationship with a child. It’s definitely about second chances. I hope you enjoy my story!